Aim: To analyse further the FTIR spectrometric patterns in more patients with lung cancer and also smokers deemed “high risk”. To identify what actual compounds may differentiate cancer from non-cancer sputum samples. Methods: Loco-regional ethical permission was obtained. Subjects: 26 patients undergoing bronchoscopy for suspected lung cancer provided spontaneous sputum samples. 16 eventually had biopsy confirmed non-small-cell lung cancer; 10 had no tumour at bronchoscopy and no evidence of cancer 6–12 months later (“high risk”). 25 control samples were also obtained from healthy volunteers and chronic obstructive pulmonary disease patients attending pulmonary rehabilitation. Process: Bronchial epithelial cell presence was confirmed in the sputum by microscopy; cells were isolated by centrifugation and freeze dried before being processed in triplicate for FTIR (Vertex 70 FT-IR spectrometer). 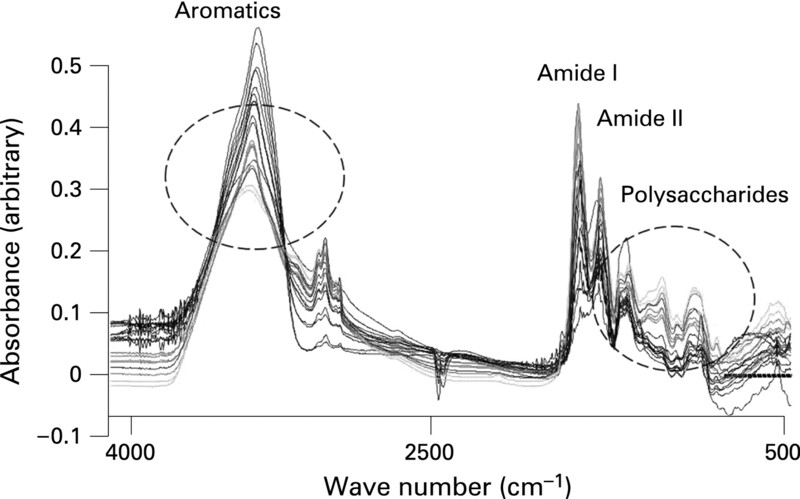 Statistics: Multiplicative signal correction was performed to improve the signal-to-noise ratios on the baseline data followed by a hierarchical cluster analysis on the FTIR spectrometry generated wave numbers; further individual metabolite profiling was performed using electrospray injection (Micromass LCT) and comparing the wave numbers generated to the (ESI)-MS profiling chemical library. Results: The cancer cases seemed to form a discrete cluster group away from healthy volunteers and the “high-risk” group. Metabolic fingerprinting detected differences in certain polyamines such as N-acetyl-l-glutamate 5-phosphate, adenosine, 5′-methylthioadenosine (these are involved in the metabolism of amino groups and urea cycle). Conclusions: FTIR and metabolomic studies on sputum cells may differentiate lung cancer patients from non-cancer patients but also could allow a greater understanding of the cellular pathways involved in this disease. Introduction: Non-small-cell lung cancer (NSCLC) is the most common cause of cancer death in Europe and North America. Although only the minority of patients are suitable for surgical resection, this offers the best possibility of cure. The aim of the present study was to examine the relationship between clinicopathological status, preoperative systemic inflammatory response and survival in patients undergoing potentially curative resection for NSCLC. Methods: A prospective study of all patients who underwent resection of lung cancer, in one centre, between 2000 and 2006 (n = 96). All had preoperative staging in the conventional manner and routine bloods including C-reactive protein (CRP), white cell count and serum albumin measured. Patients were followed up for a minimum of 19 months. The median follow-up for the survivors was 63 months. Details of adjuvant therapy were recorded. Date and cause of death were documented in those who died during follow-up (57/96). Results: The majority of patients were over the age of 60 years (71%), male (57%), underwent a lobectomy (65%) and had TNM stage I disease (66%). Of the markers of the systemic inflammatory response (white cell count, CRP and albumin), only an elevated CRP (>10 mg/l) was associated with poorer cancer-specific survival. On multivariate analysis, only TNM stage (hazard ratio (HR) 1.70, 95% CI 1.21 to 3.89, p<0.01) and preoperative CRP (HR 1.74, 95% CI 1.01 to 3.00, p<0.05) retained independent significance. Those patients with a preoperative CRP greater than 10 mg/l had a median survival of 27.3 months compared with 72.5 months in those patients with a normal CRP group less than 10 mg/l (p<0.05). Conclusion: The results of the present study indicate that, in patients who have undergone potentially curative resection for lung cancer, the presence of a systemic inflammatory response preoperatively predicts poor outcome. This study requires verification in larger prospective cohorts particularly within the context of randomised controlled trials. Introduction: Increasing neutrophil to lymphocyte ratio (NLR) on preoperative blood tests has been associated with worse survival after resection of colorectal cancer. We sought to determine factors associated with increasing NLR and the stage-adjusted prognostic impact in patients undergoing resection for non-small-cell lung cancer (NSCLC). Methods: We performed a retrospective review of patients undergoing complete resection for NSCLC between 1999 and 2005. Data acquisition was via patient medical records, blood results recorded on admission prior to surgery and follow-up by NHS database searches and hospital records. Cox proportional hazards regression was used to estimate the impact of NLR on stage-adjusted survival. Results: During the study period 178 patients underwent pulmonary resection. Of 177 patients, the majority were male 104 (59%) with a mean age of 63 years (10). The median follow-up time of 29 (interquartile range 8–56) months, and overall survival was 83% and 54% at 1 and 5 years, respectively. 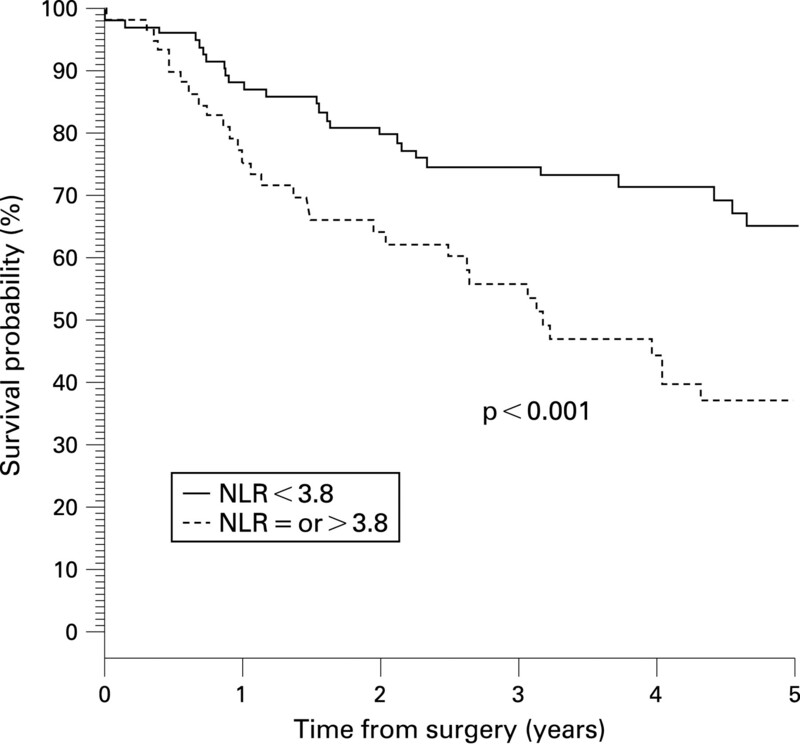 Higher stage was the only factor found to be associated with increasing NLR (p = 0.019). Total white cell count (p = 0.99), and neutrophil count (p = 0.49), age (p = 0.29), cell type (p = 0.49) were not significant predictors of mortality. On multivariable analysis after adjusting for stage, increasing NLR (hazard ratio 1.10; 1.03 to 1.17; p = 0.004) remained an independent prognostic indicator. In the 83 patients with stage I disease, a NLR value of 3.81 corresponded to the maximum joint sensitivity and specificity. When applied to a Kaplan–Meier model, a clear distinction in survival was obtained (p<0.001, fig). Conclusions: Increasing preoperative NLR is associated with higher stage but remains an independent predictor of survival following complete resection for primary lung cancer, and is a potential biomarker to stratify high risk of death in patients with stage I disease. Abstract S141 Figure Survival of 83 patients with pathologic stage I disease. Aims: Squamous cell lung cancer is a devastating disease with a poor prognosis and an absence of targeted therapeutic options. 3q is commonly amplified in epithelial cancers, particularly squamous lung carcinoma, and is a key genomic discriminator between squamous and adenocarcinoma. It is therefore likely that important oncogene(s) in the development of squamous lung cancer are located on 3q. There are theoretical advantages in studying preinvasive disease, in that the early molecular “drivers” of cancer pathogenesis may be identified. As a result of limitations in terms of tissue quantity and DNA quality, it has previously only been possible to study 3q amplification in preinvasive disease by using fluorescent in-situ hybridisation (FISH) of a few selected loci. The aim of this study was to perform the first high-resolution assessment of the 3q amplicon in preinvasive lesions in order to define the stage and incidence of 3q amplification and to identify candidate oncogenes/molecular targets. Methods: Microdissection molecular copy-number counting (μMCC) was used to analyse copy-number variation along chromosome 3 in a series of formalin-fixed paraffin-embedded preinvasive lesions (n = 24) of different histological grades. These lesions were diagnosed at autofluorescence bronchoscopy; biopsies were sectioned, pathologist-verified and dysplastic epithelium microdissected. Findings: In all cases, the low-grade lesions had a normal chromosome 3 genomic profile, whereas, again in all cases, the high-grade lesions were shown to have gain or amplification of 3q demonstrating that the histological transition from low to high-grade preinvasive disease is reflected by the onset of regional genomic instability. In addition, we mapped the region of peak amplification and defined the minimal amplified region. We next focused on this region to identify candidate oncogenes. Within the amplicon the two outstanding candidates are PIK3CA and SRYBox2. We demonstrated that the amplification of these candidate oncogene(s) is correlated with expression in the same biopsy specimens. Conclusion: μMCC facilitates high-resolution mapping of DNA from microdissected bronchial biopsies. We demonstrated that 3q (178–183 Mb) amplification is a consistent event in the pathogenesis of squamous lung cancer and is associated with those pre-invasive lesions of highest malignant potential. This approach can identify candidate oncogenes for evaluation as targets for novel therapeutic strategies. Background/Aims: Most cancer genomes are characterised by the gain or loss of copies of some sequences through deletion, amplification or unbalanced translocations. Delineating and quantifying these changes is key to understanding the genomic basis of cancer. Conventional methods for measuring copy number are limited in their ability to analyse large numbers of loci, in their dynamic range and accuracy, or in their ability to analyse small (microdissected) or degraded samples. This latter limitation makes it difficult to exploit the wealth of fixed, archived material present in clinical collections. Findings: Molecular copy-number counting (MCC), a digital PCR technique, has been used to delineate a non-reciprocal translocation using good quality DNA from a renal carcinoma cell line. We now demonstrate μMCC, an adaptation of MCC that allows the precise assessment of copy-number variation over a significant range of copies, in template DNA extracted from formalin-fixed paraffin-embedded clinical biopsies. Furthermore, we demonstrate that μMCC can accurately measure copy-number variation at multiple loci even when applied to picogram quantities of grossly degraded DNA extracted after laser capture microdissection of fixed specimens. Finally, we demonstrate the power of μMCC to interrogate cancer genomes precisely, in a way not currently feasible with other methodologies, by defining the position of a junction between an amplified and non-amplified genomic segment in a bronchial carcinoma. Conclusion: μMCC has tremendous potential for the exploitation of archived resources for high-resolution targeted cancer genomics and for interrogating multiple loci in cancer diagnostics or prognostics. Background and Aim: Angiogenic inhibitors are increasingly used alone or in combination with regular chemotherapy in the treatment of progressive cancers (eg, metastasised renal cell carcinoma). Tyrosine kinase inhibitors against the receptors of vascular endothelial growth factor (VEGFR), endothelial growth factor (EGFR) and the platelet derived growth factor (PDGFR) have proved of value. However, the expression of these receptors especially in lung metastases still has not been examined yet. Methods: Tissue specimens from 35 lung metastases of 33 randomly selected patients (23 men and 12 women) with renal cell carcinoma (RCC, n = 8), sarcoma (n = 10), colorectal carcioma (CRC, n = 6), otolaryngologic carcinoma (OLC, n = 4) and various (n = 7), treated at our department have been collected and immunohistochemically tested for the expression of PDGFR α/β, VEGFR and EGFR, using the streptavidin-peroxidase technique and the following antibodies: VEGFR2 polyclonal (Fa Acris); PDGFR alpha polyclonal (Fa Dianova); PDGFR beta polyclonal (Fa Dianova); mouse anti-human EGFR monoclonal Klon 2-18C9 (Fa Dako). Semi-quantitative analysis of the stainings was performed independently by three examiners based on the DAKO scoring system (0–3, negative to strong, complete staining). None of the patients had been pre-treated with angiogenic inhibitors prior to metastasectomy. Results: The table displays the frequency and intensity of receptor staining according to DAKO score in all pulmonary metastases. All metastases expressed PDGFR and EGFR in different intensities; the majority (86%) stained negative for VEGFR. The receptor analysis in primary tumours revealed positive staining for PDGFRα in 100%, PDGFRβ in 69%, VEGFR in 15% and EGFR in 55%. Comparison with tumour stage, tumour grading and nodal status did not reveal significant correlations. Conclusion: Our investigation of a pilot character represents a “biomarker-based” analysis of pulmonary metastases of different primary tumours; surprisingly, the majority of metastases stained negative for VEGFR as did the corresponding primary tumours. We agree with the problem of the sample size being very heterogenous; nevertheless, we conclude that an immediate “tumour profiling” already at initial diagnosis and a following, primary and adjusted anti-angiogenic therapy should be considered as an emerging necessity in the light of an individualised tumour therapy.